Anaheim, CA. – The NAMM show has marked a series of successes for CHAUVET DJ over the years. 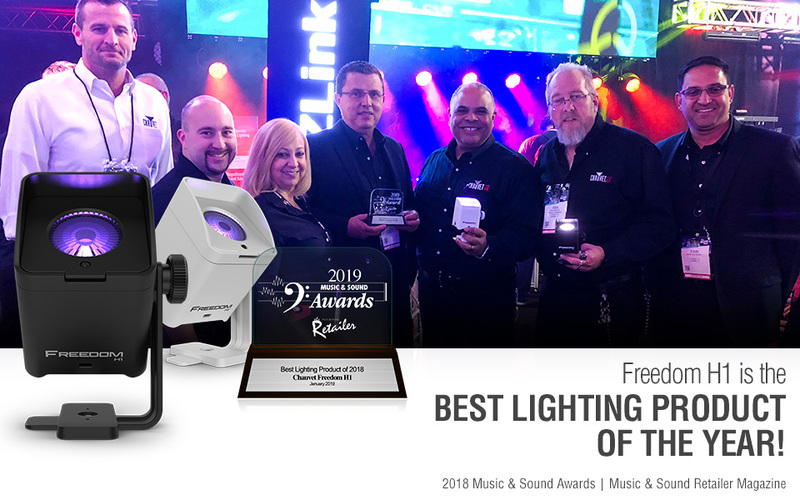 This year the streak continues as CHAUVET DJ Freedom H1 has been named Best Lighting Product of the Year in the Music and Sound Retailer magazine’s 33rd Annual Music & Sound Awards. The award was presented to CHAUVET DJ at their booth during the NAMM show this month. CHAUVET DJ’s Freedom H1 has been the buzz of the special event lighting industry since its introduction in 2018. The industry responded by making it the Best Lighting Product of the Year. This marks the fifth time a CHAUVET DJ has won the award. The CHAUVET DJ Freedom line of 100% wireless battery-powered products has included some of the most powerful event lighting tools for years. Freedom H1 packs all of the punch of its bigger-sized predecessors. It is a compact 100% TRUE wireless, battery-operated, LED wash light with a built-in D-Fi transceiver. The fixture features a single hex-color (RGBAW+UV) 10W LED. Its magnetic base makes it easy to mount the light to most metal surfaces providing added versatility. Because of its small size, Freedom H1 features effortless transport and set-up. Freedom H1 has a digital display for easy control and adjustment of all settings. Multiple control options include stand-alone mode, wireless DMX, or IR. The Freedom H1 X4 system includes 4 fixtures, 4 diffusers, a carry bag, multi-charger, and IRC-6 remote.